In the past years, many certificates have passed the revue in the Food and Agricultural chain. In 1998, British Retailers made a set-up to develop a common standard for the entire food sector. From this standard the British Retail Consortium Technical Standard and Protocol (BRC) has orginated. The BRC protocol describes hygiene and food safety requirements for food industries which deliver directly to the retail sector. BRC has similarities with HACCP, such as a risk analysis according to the HACCP and an analysis of Critical Control Points (CCPs) in the food production process. Moreover, in the field of hygiene and building engineering aspects BRC is more detailed. 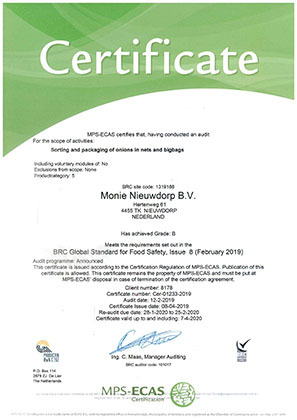 Since 2004, Monie has been certified according to BRC standards. Since januari 2006, Monie has its own registered RIK. V A special quality manager is responsible for implementation of the Quality System. By this internal system the excellent "Monie quality" of the product can be guaranteed. 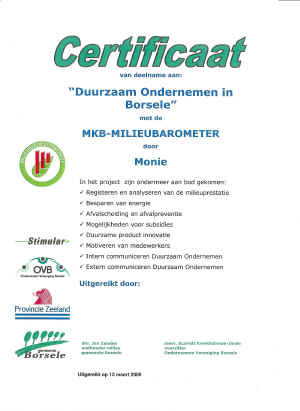 In the context of Corporate Social Responsibility (CSR) Monie has followed the course "Sustainable Development in the Municipality of Borsele" in 2008. In this course, special attention is given to the SMB environment barometer, recording and analyzing environmental performance, energy conservation, waste prevention and sustainable product innovations. Also in 2008, Monie has purchased an AED (Automated External Defibrillator) in the context of Corporate Social Responsibility (CSR). This is realised in co-operation with the Rural Community Council (RCC) of Nieuwdorp. This AED can be used by the entire village of Nieuwdorp. Moreover, five persons of the "Monie-team", are trained for professional use of the AED. 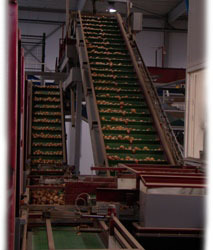 Monie is also a member of the Association of Onion Processing Companies (ZUVER). 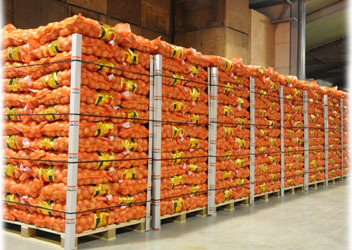 ZUVER recently presented a report about added value of by-products from the onion processing industry. Some interesting applications are furthermore developed. These applications are focussed on sustainable energy production, composting of the whole stream of organic by-products and isolation and production of natural coloring dyes and food additives which can be used in textile, cosmetical, food and pharmaceutical industries. In 2007, EurepGAP has been renamed to GlobalGAP. The name "Global" is given because of the worldwide (Global) acceptance. The protocol describes the minimum requirements for a Good Agricultural Practice (GAP) for growers and suppliers of fresh fruit and vegetables. Certification according to GlobalGAP is supported by nearly all (retail) organisations in Europe, but also worldwide. 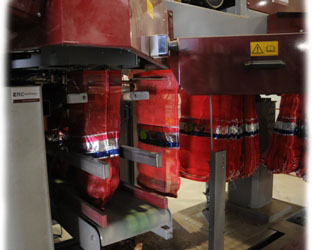 The goal of GlobalGAP certification is traceability. Other important points are sustainability, risk management in the field of water and environmental aspects and minimizing the use of pesticides and fertilizers. Moreover, the GlobalGAP protocol is developed to build customer confidence. 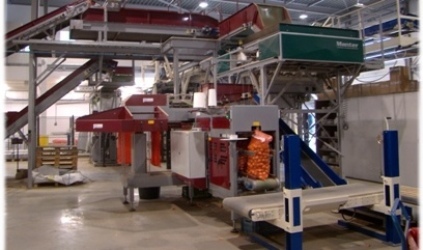 In 2004, Monie havs constructed a Product Marketing Organisation (PMO) where about 40 growers have been certified according to the European Retail Produce Working Good Agricultural Practice 2004 (EurepGAP) directives. Because more and more growers are convinced of the importance of GlobalGAP certification, a collective certification is less necessary. Approximately 70% of our growers have been GlobalGAP certified individually. However, Monie still provides support and advices to individual growers. If you are interested in GlobalGAP certified product, please contact us. 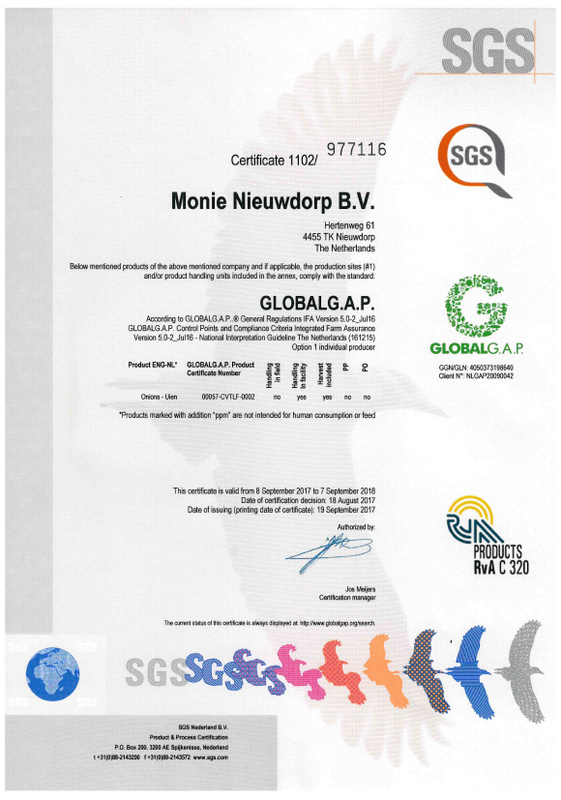 We can send the GlobalGAP certificates of our products digitally by e-mail. 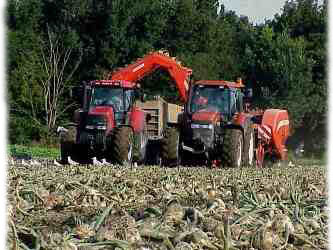 The onionfly is the most dangerous insect to healthy onions. Pest control therefore is very important. 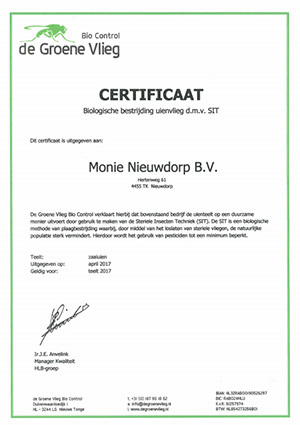 Established in 1980, De Groene Vlieg (The Green Fly) has been specialising in pest control, and Monie is happy to collaborate with them to ensure safe and adequate pest control. This is good for you, for the field and for the environment.